Speakers at a programme called upon all the educational institutions and the media to form anti-sexual harassment cells. They also urged all to ensure safe working environment for women. They came up with the calls at a seminar arranged by Metoo, Bangladesh at Jatiya Press Club in the city on Sunday. 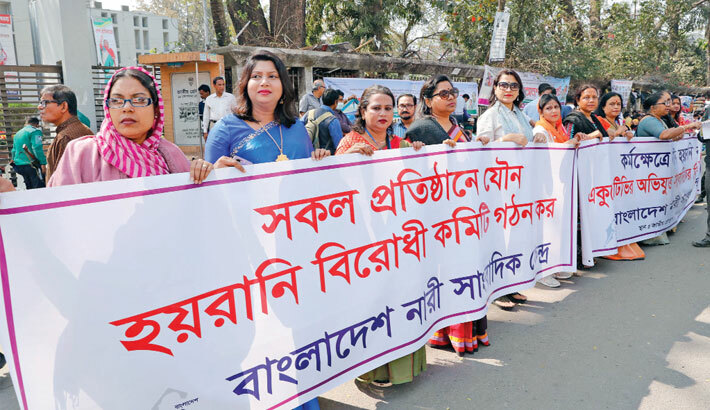 Speaking on the occasion, journalist Sajeda Huq said, “We request all educational and professional institutions, including mass media, to form anti-sexual harassment cells. Speakers of the seminar thanked Ekushey TV authorities and law enforcement agencies, as they (Ekushey TV) took action immediately against its chief reporter who allegedly harassed his colleague sexually. Among others, journalist Minala Debi and NGO worker Musfiqua Laizu spoke at the event.